My body is healing...It's been a week since Jedi and I'm now back to pre-pregnancy weight. My body has pretty much healed, except when my legs get tired because I was bedridden for 36 hours, but my mind hasn't quite healed. I have no idea what the grief cycle is supposed to be like but I have my ups and downs. I have been making cranes; in Japanese culture, it is believed that if you make 1,000 cranes, you will be granted one wish. 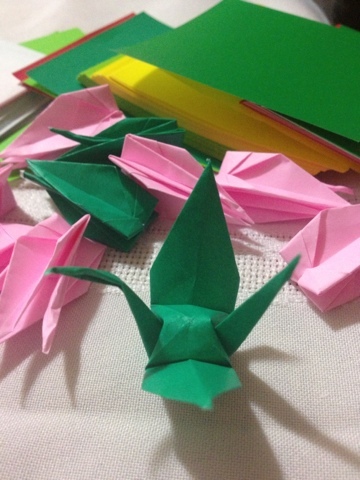 I'm making my cranes to wish for Jedi to be eternally happy, wherever he may be, what ever religion heaven he is in. HJ says that he has the purest soul, and I believe that he will be waiting for us. I'm sorry my blog have been depressing lately, but quite honestly I have no idea who reads these blogs anyway and it's a part of the healing process for me. I will have better days soon I'm sure.... Being with BJ really helps... and the crane making really helps. Buddhist heaven, Christian heaven, wherever... As long as Jedi is happy in the purest of heavens, I will be at peace. I haven't been here for a while...sending prayers and hugs to you and your family. My best friend went through a situation similar to yours and it was heartbreaking, but like you, they believe their baby is in a beautiful place. Take good care of yourself and find comfort in your hubby and Jacob.